Cars, like people, communicate when something is wrong. They tell you this by developing an unusual noise. While some car sounds are normal and harmless, some noises need immediate attention. An unfamiliar squealing, ticking, knocking, clunking or hissing is an important indicator of part wear or other mechanical problems. If you hear a loud tapping or knocking sound in your engine, stop driving as soon as possible. Continuing to drive with the warning sound can cause severe and expensive engine damage. Many car owners ignore such abnormal sounds for fear of extensive repair. Please do not make this mistake. Ignoring your vehicle's moans and groans may leave you stranded on the side of the road and cost you a fortune to repair. A howling, whining or even high-pitch "singing"
Noises can come from a variety of sources, and repairs could take from a few minutes to many hours. Some noises have very simple fixes, while others can be outrageously difficult to repair. Our experienced technicians can replicate and diagnose most noises. They have heard the same sounds repeatedly and most often know exactly where to look to diagnose a noise within a few minutes. Depending on where and what sounds you are experiencing, diagnostic tools such as computers may be used in conjunction with technician expertise. 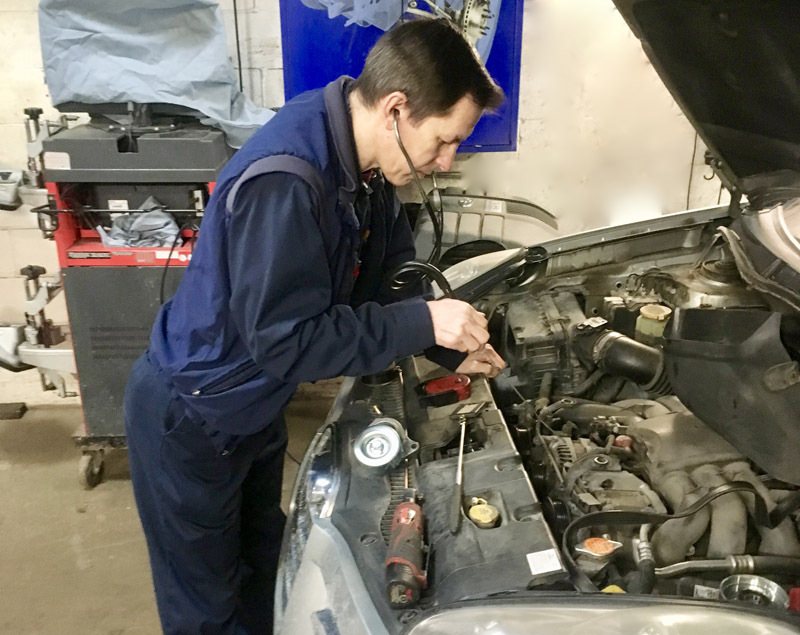 However, some noises can be extremely difficult to diagnose, especially if the vehicle only makes the noise under specific conditions or randomly. In such cases, the technician would have to test drive the vehicle until the sound is heard or inspect every component in the vehicle. You can help in such cases! You can hop into the car with the mechanic and try to replicate the conditions under which the sound occurs. This may result in instant determination of the source of the noise. If you notice any strange sounds coming from your vehicle, bring it to Right Way Auto Repair. Prompt action on your part and our expert technicians can ensure your car is purring contentedly again. Please contact us online or call us at (905) 381-9285.